For school children today, a “lunch box” is a simple and utilitarian affordance (indeed, it’s rarely even a box). But for many readers (and your correspondent), the lunch box was much more than a way to schlep a sandwich; it was a totemic possession. 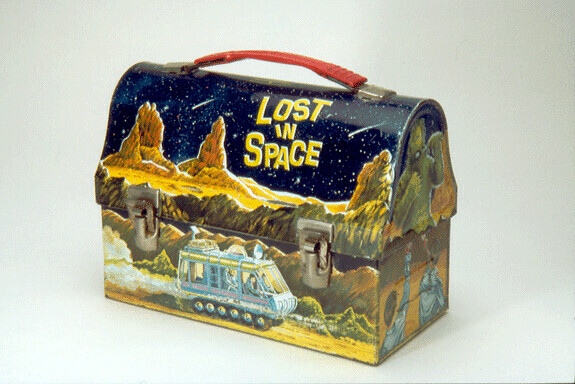 In the days before tee shirts could be worn to school (much less tee shirts with cool logos or designs), a lunch box was a proclamation of allegiance– I dig Lost in Space, I adore Barbie– a step toward public identity and an ingredient in the gel that held adolescent school friends together. 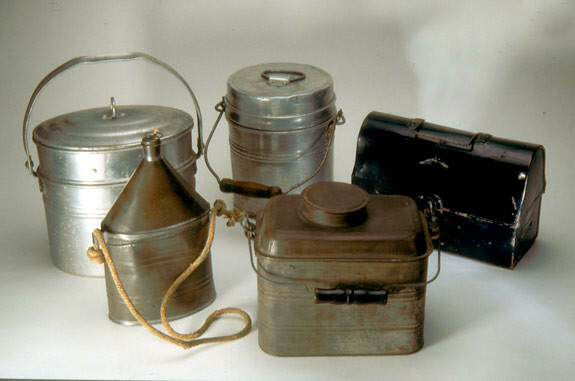 Lunch boxes date back to the 19th century, when working men began to carry them to factories or construction sites or mines to protect their mid-day meals from the perils of the job site. By the 1880s, school children began to emulate their daddies by making similar caddies out of empty cookie or tobacco tins. The first commercial lunch boxes, which resembled metal picnic baskets decorated with scenes of playing children, came out in 1902. 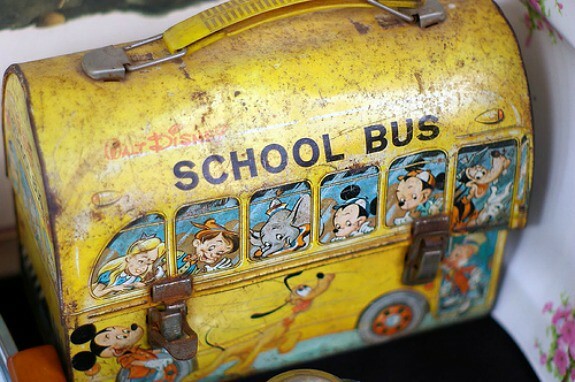 And the first popular character, Mickey Mouse, appeared on a lunch box in 1935. 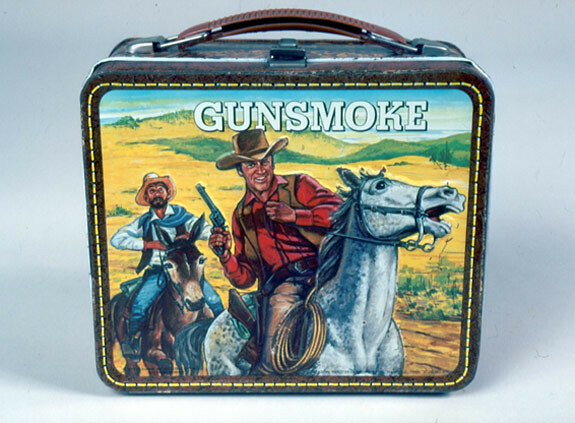 But the lunch box as personal statement really took off in the 1950s, fueled by television. Executives at a Nashville company called Aladdin realized they could sell more of their relatively indestructible lunch boxes if they decorated them with the ephemeral icons of popular culture: even if one’s Cisco Kid lunch box was barely scratched, one would want to trade in his pail for one featuring Marshall Dillon. Manufacturers moved from metal to vinyl briefly in the 60s, then switched to molded plastic. But the growth of school lunch programs (and relaxed attire rules, allowing students to wear their enthusiasms) began to eat into the market; Aladdin left the business (though Thermos remains). Today lunch boxes are generally made of vinyl, with foam insulation, and an aluminum/vinyl interior (so that they’re better at retaining their temperature but are less rigid/protective)– and they’re no longer the cultural signifiers that once they were. Perhaps unsurprisingly then, collecting older lunch boxes has become an active hobby. As we wrap our apples, we might recall that it was on this date in 1961 that Congress passed Public Law 87-293, authorizing and funding The Peace Corps. To promote world peace and friendship through a Peace Corps, which shall make available to interested countries and areas men and women of the United States qualified for service abroad and willing to serve, under conditions of hardship if necessary, to help the peoples of such countries and areas in meeting their needs for trained manpower. 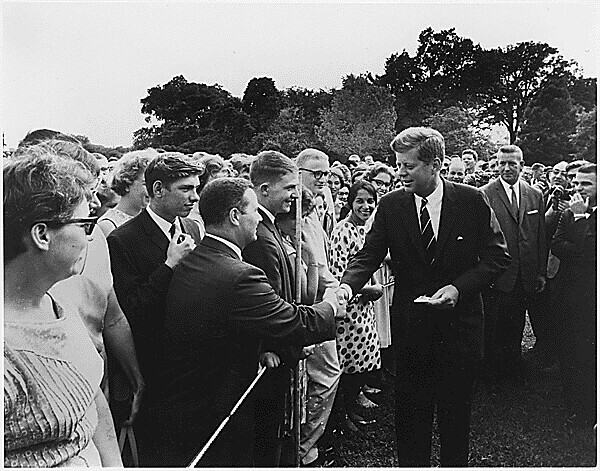 Since 1961, over 200,000 Americans have joined the Peace Corps and served in 139 countries.